Demonstrator Dana Knezevich shows visitors how to process plants into fibers for cordage. Participants are set, additional overflow parking lots are ready, and final preparations are being made – Meadowcroft Rockshelter and Historic Village’s American Indian Heritage Weekend is almost upon us and it’s time to go full tilt putting the finishing touches on the event. The fourth weekend of September is the time when Meadowcroft steps back in time with the help of a team of skilled craftspeople who recreate life in the prehistoric past of Western Pennsylvania. For those unfamiliar, Meadowcroft Rockshelter is the oldest site of human habitation in North America. Each cultural period, from the Paleo Indian and Archaic foragers through the woodland horticulturalists to historic peoples moving across Western Pennsylvania, is represented in the deeply stratified archaeological site. The development of lithic, fiber, ceramic, and hunting technologies can be tracked through the evidence found at the Rockshelter. At the American Indian Heritage Weekend event, a variety of techniques used by these early inhabitants are on display. What could the small bits of cordage found during excavation have been used for? Why were there so many tiny flakes of flint in the assemblage? How did the campers manage to cook themselves a meal? These and many other questions will be answered during this year’s event. To really give visitors an understanding of the effort it took to make a life in the days of stone, bone, and wooden tools, visitors are encouraged to try their hand at the various skills being demonstrated. 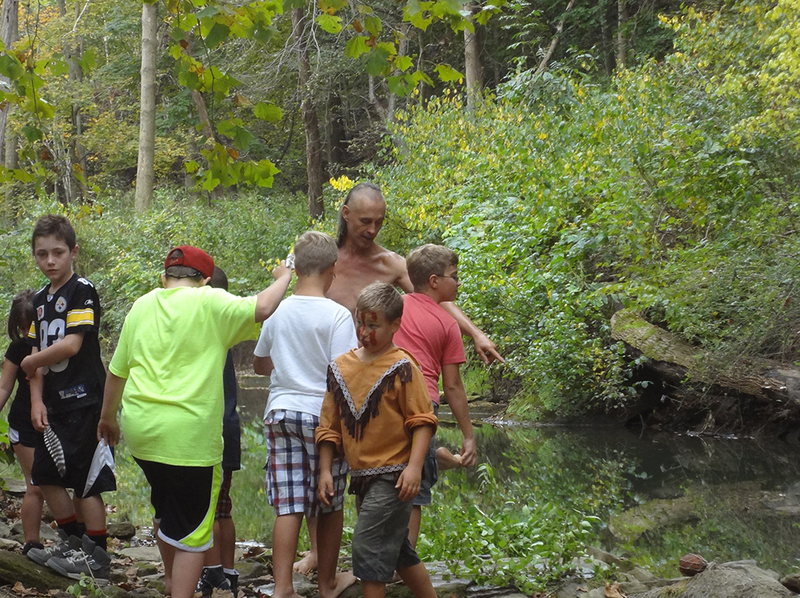 Biologist and presenter Doug Wood shows visitors the fishing hole at Cold Creek. 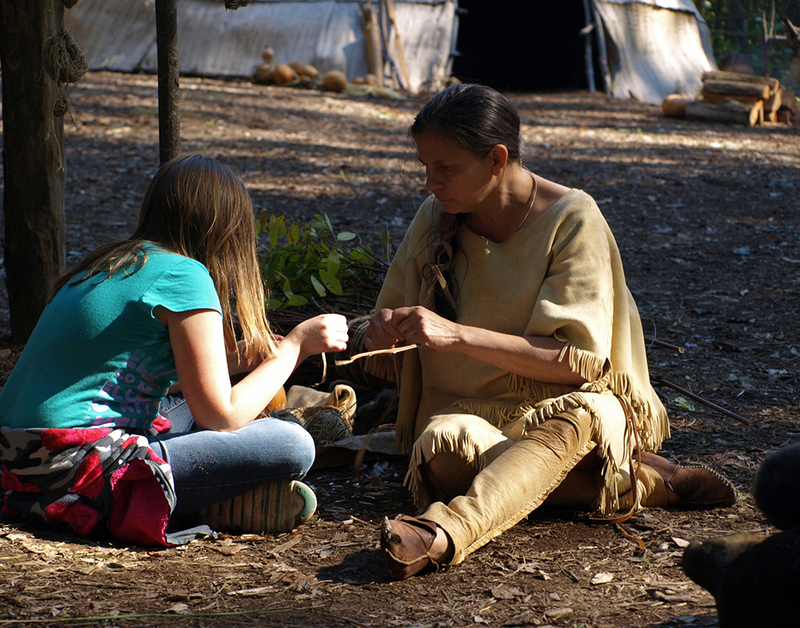 In our Prehistoric Indian Village, the weekend provides a unique experience for visitors to watch and attempt a variety of skillsets mastered by early Pennsylvania inhabitants. Since opening our 18th century Frontier Trading Post, the event has expanded through time, so that visitors are able to track the adaptations of those ancestral skills with the adoption of European trade goods. There is also an Indian fishing demonstration along Cross Creek, which is located across Meadowcroft Road from the Rockshelter parking lot. 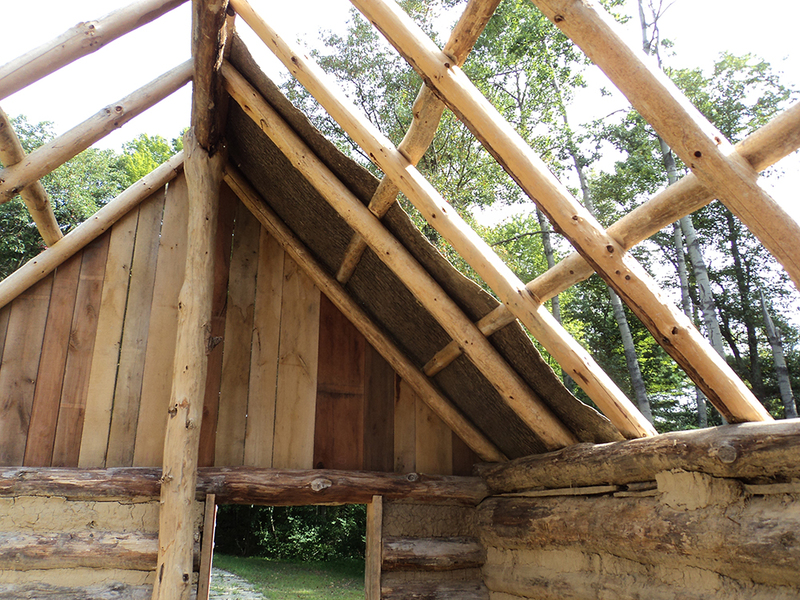 In addition to 19,000 years of Western Pennsylvania history, Meadowcroft Rockshelter and Historic Village also provides a glimpse into the lifeways of the local cultures that endured throughout history. The American Indian Heritage Weekend provides visitors with an interactive glimpse into the lives of our area’s historic and pre-historic residents. In addition to the regularly scheduled re-matting of the wigwams for the weekend, a new roof for the cabin in the Frontier Trading Post was also added for the event this year. 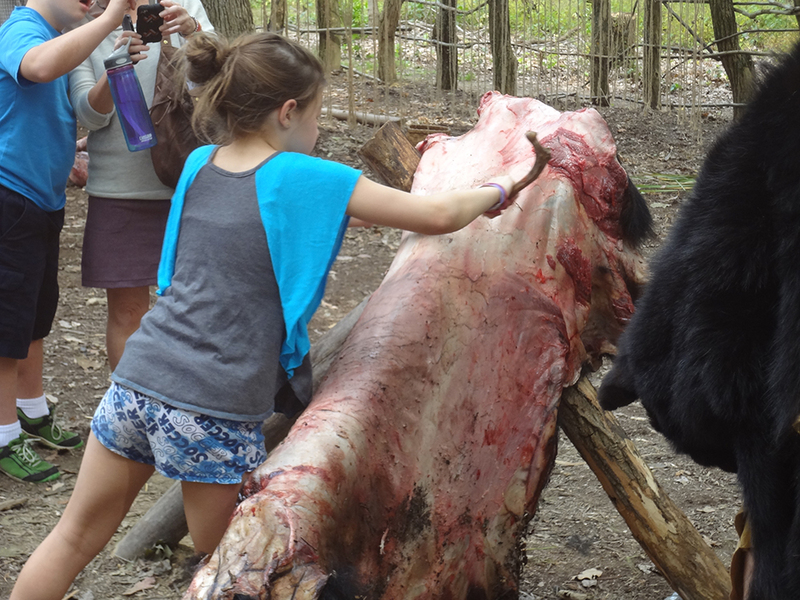 A young visitor tries out the proper technique for fleshing a hide.